We are an independent company with rich experience in providing jet washing services available within Putney and the surrounding areas. We can help you if your driveway is covered with tracks from your car’s tires, or if you have your walls or garage doors covered with graffiti. Certainly, you will not succeed in finding better rates and more competent technicians than ours. Our specialised equipment and high-performance jet washers are capable of removing obstinate grime from a wide range of surfaces. Call us and we promise to deliver impressive results! When it comes to quality and pricing, we always strive to surpass our customers’ high expectations. This is why we employ a team of expert technicians who have rich experience with specialised high-pressure jet washing machines. These are guaranteed to remove all dirt, grime, moss, algae, and lichens from exterior areas like pathways, roofs, decks, driveways, patios, garage doors and walls. We value our customers’ trust and aim at establishing a lasting relationship with them that is built on mutual respect. Because of this, we never charge them with any hidden costs and provide free quotes to determine the price in advance. If you find our pricing a little outside your budget, you can skip on our services without any hassles. 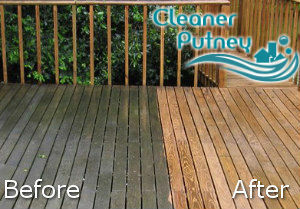 Don’t even think of replacing your decking or the slates of your patio if they are covered in grime. 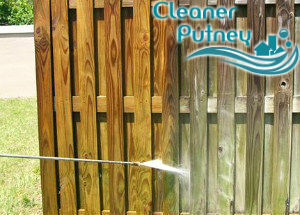 Our jet washing services in Putney, SW15 will effectively restore all surfaces, making them look brand new again. We are on call throughout the week, including on bank holidays. Get in touch with us any day to request your free estimate!